My new favorite - Mission Maxi Dress cut on the bias. I matched the stripes so that I could create a chevron print with the striped fabric. I also wanted to try something different with the back, so I cut out view B and added a braided piece to the back. I used this tutorial to make the braid. To determine how long the braid should be, I measured the distance from center back to the neckline. I then doubled that length for the braided fabric. After I braided the fabric, I pinned it to center back and measured how much of the braid I needed to cut off. I made sure to allow extra fabric for the seam allowance when sewing the braid to center back. 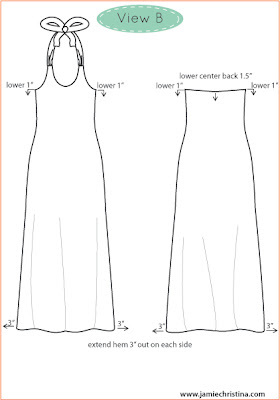 The dress is cut on the bias with 2 front pieces and 2 back pieces rather than cutting one front and back on the fold. Be sure to add the seam allowance for the center seams. I didn't even think of folding the fabric on the bias and then cut the front and back pieces on the 45 degree angle fold. This would have eliminated the center seam and the chevron stripes would have lined up perfectly. I'll give that a try next time. Actually, that would be a bad idea. I would have diagonal stripes and not chevron (thanks Caroline for the warning). I also altered the pattern slightly. I dropped the armscye 1" and lowered the center back by 1.5". I adjusted the hem by extending it 3" on each side. Below is an illustration of the alterations (click to enlarge). Now all I need is warm weather so that I can wear the maxi. It hailed yesterday and we are on spring break right now. Crazy! I love this infinity scarf! It's from Urban Outfitters. I usually get headaches when I wear scarves, but not with this scarf. It's light weight and super drape-y. Not to mention the snuggle factor is off the charts with this scarf. For now I'll have to cover up my Mission Maxi with a long cardi, scarf, and thick tights to keep me warm. I love your dress cut on the bias! This is my favorite maxi pattern. And as soon as I find stripped fabric I love, I plan to do this as well! So glad I finally got my pattern! "I didn't even think of folding the fabric on the bias and then cut the front and back pieces on the 45 degree angle fold. This would have eliminated the center seam and the chevron stripes would have lined up perfectly." Just as a warning, this will result in a dress with diagonal stripes across the whole front or back, not a chevron pattern -- just as if you cut it out in one big flat piece. To get chevrons from a striped piece of fabric you need some kind of seam. This is amazing! I just LOVE it. I need to find so striped jersey and shamelessly copy yours. You are so beautiful and so is this maxi dress! I Love what you did and it looks amazingly gorgoeus! 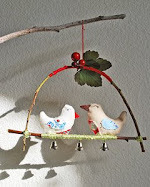 Happy sunday and love to you! Thank you Jacqueline! It is good to hear from you. I'll have to click on over to your sweet blog to see what you've been up to. 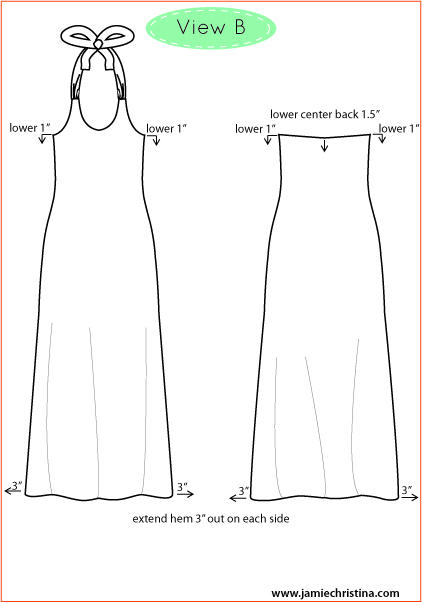 I wondered if you could give the adjusted yardage required for a bias maxi? I just received my pattern and am SO excited, but definitely want to try this bias version! Many thanks! Hi Liz! I did not record the yardage used to make the dress. Sorry =( When I make another one, I'll be sure to update this post with the amount of fabric used to make the bias Mission Maxi.